In recognition of the growing interest in immigration to the United States, Immigration Law of Montana, P.C. is instituting a scholarship program (ILM Scholarships). If immigration interests you, and you can express your ideas in writing, you’re welcome to apply for one of the three scholarship opportunities. ILM Scholarships is awarded on three levels, local, statewide and national with three different scholarship prizes. In order to participate in one or all of these scholarship opportunities, you must apply via email providing your name and address along with the name of the institution that you are attending. You must indicate which of the ILM Scholarships you are applying for. If you are eligible, you may apply for more than one. We must receive your written essay no earlier than March 1, 2018 and no later than April 30, 2018 through the email listed below. At the time that you submit your essay, you must submit a transcript evidencing a GPA of 2.5 or above. 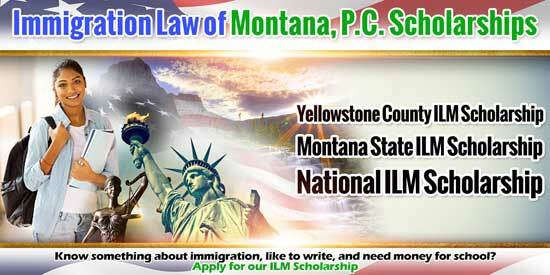 All applications must be sent to ILMScholarships@immigrationlawofmt.com. You will receive an automated response acknowledging receipt of your essay.